"Gladys loves nothing better than tinkering with car engines and driving at top speed. She also dreams of learning to fly a plane. But it's 1914 and people, especially her mother, keep reminding her that women are not supposed to be adventurous. When war comes, Gladys offers her ... read full description below. 'This will be a short war and women will not be needed. If you want to help the war effort you should stay at home and knit socks and balaclavas.' But Gladys is not the kind of person who stays home and knits. She is determined to go to war. There are many stories about men who enlisted and courageously fought for their ideals. 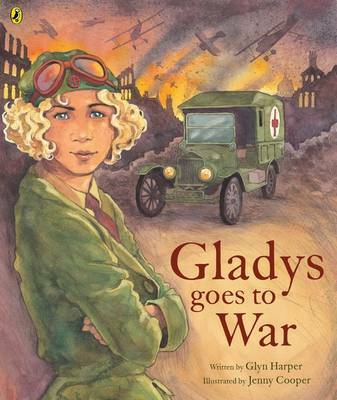 In Gladys Goes to War, the award-winning team of Glyn Harper and Jenny Cooper brings us the amazing true story of Gladys Sandford, ambulance driver, adventurer and trailblazer. Amongst her lifetime of heroic achievements, she actively served in the First World War and was the first female to gain a pilot's licence in New Zealand. Glyn Harper discovered and researched Gladys's story and his account of her exciting life will captivate children of all ages. Brought to life with Jenny Cooper's exuberant illustrations, Glady Goes to War will cause readers to wonder why they haven't heard of Gladys before now. Glyn Harper (Author) Glyn Harper is Professor of War Studies at Massey University in Palmerston North, New Zealand. He is Massey's Project Manager of the Centenary History of New Zealand and the First World War. A former teacher, he joined the Australian Army in 1988 and after eight years transferred to the New Zealand Army, where he rose to the rank of lieutenant colonel. Glyn was the army's official historian for the deployment to East Timor and is the author of numerous history books. He has written a number of children's books, of which Le Quesnoy, Jim's Letters, Roly, the Anzac Donkey and Gladys Goes to War are the most recently published. Jenny Cooper (Illustrator) Jenny Cooper is an award-winning and prolific illustrator of more than 70 children's books and says she finds each title 'completely different and a new adventure'. In October 2015 Jenny was honoured as one of New Zealand's foremost illustrators with the presentation of The Arts Foundation Mallinson Rendel Illustrators Award. The award's patron Ann Mallinson declared her the 'perfect recipient', stating that 'whether a pencil sketch or a realistic, photographic based style, Jenny's illustrations jump out of the page with an invigorating spirit'. Jenny lives in Amberley, near Christchurch.